Can you believe it’s already August? I can’t…this summer is going by way too fast! We have been so busy lately; that last weekend was the first weekend I went to a farmer’s market this summer, I know super depressing. As I was walking around looking at all the delicious vegetables, flowers, and homemade jams that were on display, I noticed a tent with four huge baskets of fresh peaches… JACKPOT! 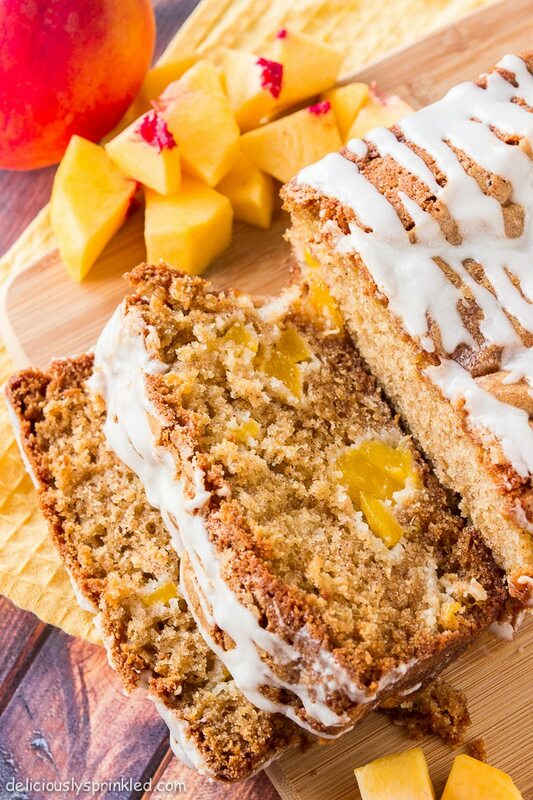 I couldn’t wait to get home to start making my glazed peach bread, which is one of my all-time favorite summer quick bread recipes. It is so moist and delicious; it’s the perfect bread along side a cup of coffee or even a refreshing summer dessert. If you have fresh peaches on hand, you need to try this bread. I know your going to love it as much as I do. Enjoy! Preheat oven to 350F degrees. Spray a 9x5 inch loaf pan with non-stick cooking spray. Set aside. In a large bowl, whisk together the flour, baking powder, baking soda, salt, and ground cinnamon. Set aside. In a medium sized bowl, using an electric or stand mixer, beat together the butter, sugars, and vanilla extract. Add one egg at a time, mixing between each egg. Beat in heavy whipping cream. Pour wet mixture into dry mixture, using a spatula to mix until just combined. DO NOT OVERMIX. Fold in peaches. Pour bread batter into prepared pan. Bake for 50 minutes or until toothpick inserted into the center comes out clean. Let cool completely before glazing with vanilla glaze and slicing. In a small bowl, mix powdered sugar, heavy whipping cream, and vanilla extract together until a light, creamy glaze forms. Drizzle on top of cooled bread right before you are ready to serve. * You could use unthawed frozen peaches. Try my Peach Cobbler next, it’s delicious topped with vanilla ice cream! Can frozen peaches be used instead of fresh? OMG sounds delish! ! Can this be made with canned peaches? 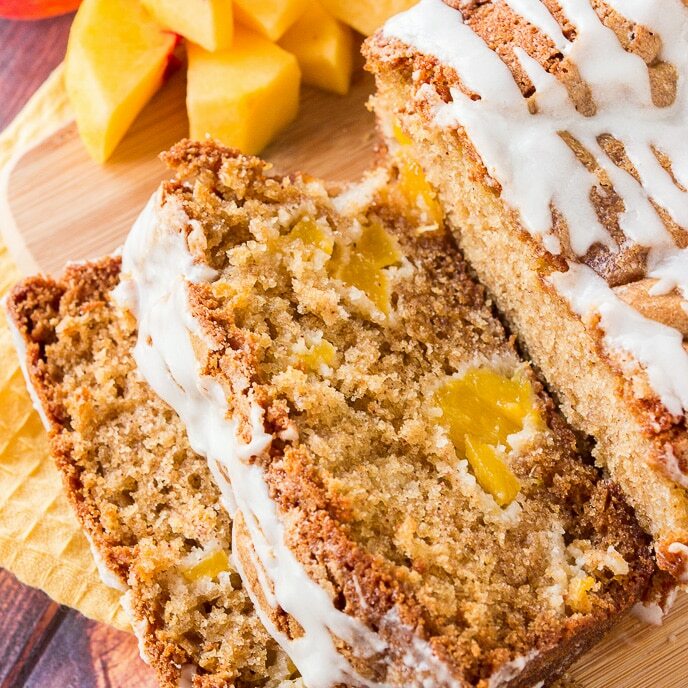 This glazed peach bread looks wonderful. You definitely hit the jack pot! And anyone who gets this recipe also hit the jackpot. What an incredible bread recipe! I can’t turn down a soft and tender bread stuffed with fresh peaches! The bread looks absolutely delicious! I still haven’t had a peach yet this summer – am I crazy?! Need to get my hands on some and make this bread. Pinned! I’d love to wake up and have this on the table! It looks amazing! Jenn, this looks absolutely divine!!! I am loving all the peach recipes 🙂 I’m slightly obsessed with peaches lately. I wish I had this bread to wake up to today. Such a great breakfast bread! It’s exactly how I want to wake up every morning…with some kind of glazed breakfast bread! Yum!! August?! Where did summer go! This quick bread looks delicious. Love all those peaches packed in there! 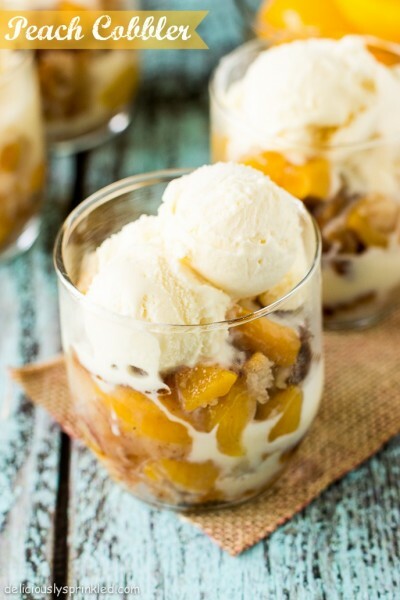 I just so happen to have a basket full of peaches that would be perfect in this recipe today! Thank you! Gorgeous. Lovin’ peaches this year. Pinning! I’ve never had peach bread, but I’m thinking that needs to change really soon. This looks amazing! !